The Mollart Engineering group of companies is a precision mechanical engineering business with an international reputation in the pioneering development and building of deep hole drilling machine tools, including gun drills, deep hole boring and bore finishing. With headquarters in Surrey and a production facility in South Wales, the group also has a high level of expertise as a subcontract machinist and fabricator. They carry out multi-axis machining on complex, often high value components, along with part fabrication and component assembly. Mollart works across a wide sector of industries including aerospace and defence, automotive, oil and gas, subsea, mould and die, nuclear, medical, semiconductor and telecommunications. 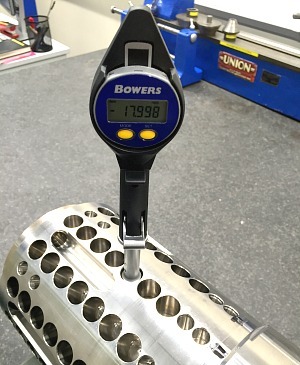 Mollart Engineering has recently purchased a Bowers XTL digital lever bore gauge in order to measure Inconel 718 hydraulic manifolds used at extremely high pressures of 20,000psi in the oil and gas industry. The piston bores of the Inconel manifolds have a strict size tolerance and 16 micro-inch surface finish requiring high precision measurement to adhere to strict industry tolerances. Because the manifolds are working under extreme conditions, the surface finish and exact size of the piston bores are critical for the function and service life of the components manufactured. 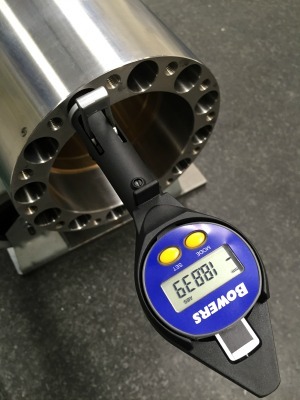 Before Mollart purchased the Bowers XTL digital lever bore gauge, they were using a bore comparator to measure the size of the bores. Unfortunately the device was leaving scratches in the bore that contravened the surface requirement finish. This meant that a subsequent manufacturing operation was required after inspection to achieve the desired surface finish. The XTL Digital Lever Bore Gauge has a simple ergonomic action and can be fitted with a wide variety of analogue and digital indicators, or even transducer probes. The range can also be provided with IP65 rated digital indicators, which render the device resistant to coolant, water and airbourne particles. A ‘wireless’ gauge module is also available, which enables cable free communication with remote data collectors. With a measuring range of 6 – 100mm and simple 2-button operation, the XTL Digital Lever Bore Gauge is excellent for vertical bore measurement and provides fast, accurate measurement.